Successfully Added Special Edition Cellphone Watch to your Shopping Cart. 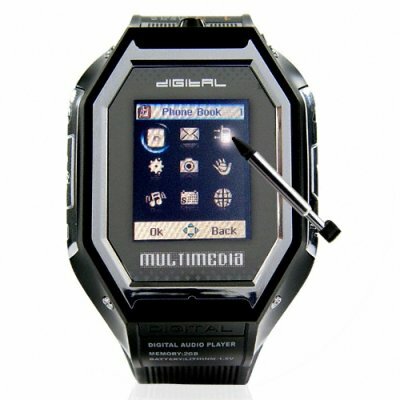 Due to popular demand for our previous cell phone watch we have been able to source a limited run of a new improved model complete with better features including a cleaner look and higher resolution camera. Get the new Special Edition cell phone watch and always be ready with a tri-band Mobile phone, and mobile entertainment system strapped to your wrist. Stand out features include a great organizer, responsive touchscreen and cool audio over Bluetooth, so you can listen to all your favorite tunes on your wireless headphones. Great for cyclists, commuters, and anyone who wants to stop carrying round bulky products in their pockets or handbag. Sure to be a great seller order in bulk now to secure your stock and get the best wholesale prices and save on shipping. Don't be the one to miss out: order it before stock runs out. - Phonebook: Quick Search, Search Contact, Add New Contact, Copy All, Delete, Caller Groups, Extra Number, Settings, Caller Picture, Caller Ringtone. Its a very fun item to have but the screen is so small its hard to do a lot in. b ut its great for taking that ocasional call i use on my motercycle with the bluetooth headset its cool. It's a unique and Innovated product..I bought it for Son..and He is very happy...and price wise is unbelievable..It is very good for giving gift to love one's..